How Far is RV Aadvik? R. V. Nirmaan Pvt. Ltd. brings to you an ultra modern residential project 'Aadvik'. The project is located at Kompally, Hyderabad. 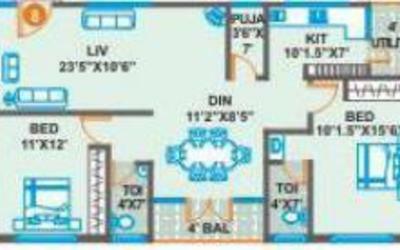 It offers 2 & 3 BHK residential apartments. Apartment area ranges from 956 to 1926 sq. ft. The architecture is classy and contemporary, yet counterpointed by vast expanse of vast space (10,000 sq.ft. in all) that is a promise of peace of serenity. The perfectly manicured gardens and beautifully trimmed hedges add to the elegance of the complex. RV Aadvik is a lot like Hyderabad - a place of beautiful contrasts. Though we call them apartments, they have been designed along the lines of independent living units. 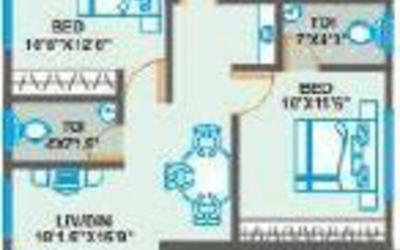 The apartments are housed in exclusive blocks with a minimum distance of 6' 6â€� between each block. One block comprises of independent units, while another block is built on row house concept - apartments with elevated entrance and sunken corridors. Common walls are avoided and such other features so that the apartments offer an open, airy feel of independent homes. The sense of privacy here is absolute and you feel so free and enjoy every nuance of life. Located at an excellent locality of Hyderabad which is much far from the hasty tones and fuzziness of the city.With bizarre hi-tech specifications of quality construction and architectural designs, you can be sure of loving the place where you would see your bright future. Offering you all sorts of luxuries. Taking a first step towards this project for investment, you can gain higher profits in future as it is located at a great developing neighborhood close to the civic amenities of the metropolis. It is one of the best residential property in India for investment as the property site is close to all the public utilities. 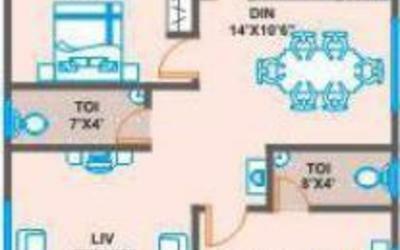 This property in Hyderabad offers good quality construction and amenities. Five lifts of 6 passengers capacity. Kone or equivalent make. Vitrified tile cladding on the lift sidewall at ground floor and other levels.